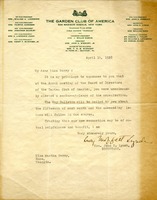 Letter to Martha Berry from Mrs. John H. Lynch, secretary, informing Miss Berry that at the last meeting of the Garden Club of America she was unanimously elected a member-at-large of the organization. Miss Berry is also informed that the bulletin would be mailed to her and that her dues will follow in due course. In conclusion, she hopes that their new connection will be helpful to both parties. 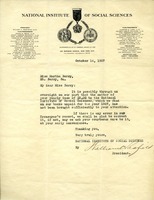 Redfield notes that Miss Berry has not paid her 1927 dues of $5.00 have not been paid and requests her to pay at her earliest convenience.